(c) 1980,2017 All Rights Reserved. 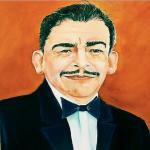 Álvaro Guevara y Vázquez,Composer,B.M.I. This video contains my Valse Opus 62, 2016 And Nocturne Opus 13.No.1, 1980.